The histories, deep-seated beliefs, and ethical systems that make up the world’s religions are some of the most important forces at play on our incredibly diverse planet. 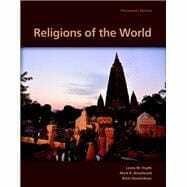 Religions of the World, Thirteenth Edition guides students as they explore each of the world’s major faiths, imparting the knowledge they need to better understand today’s world. By explaining religious diversity and complex themes within a historical context, Religions of the World helps students relate to cultures very different from their own. Religions of the World, Thirteenth Edition is also available via REVEL™, an immersive learning experience designed for the way today's students read, think, and learn. Lewis Moore Hopfe (1935—1992) graduated from Baylor University in 1956 with a B.A. in history and religious studies, an M. Div. degree from Southwestern Baptist Theological Seminary in 1960, and his Ph.D. in Old Testament studies from Boston University in 1965. Dr. Hopfe began his teaching career in 1965 as an instructor in religious studies at Kendall College, Evanston, Illinois. During his early years of teaching it became apparent that there was a need for an introductory textbook for the study of world religions. He said, “Religion is never a simple subject, and can become complex and intricate to the complete dismay of the beginning student.” His goal was to provide the student with a reasonably brief and readable text that did not shortcut or simplify religions, but did not delve too deeply into the technicalities. Responding to this need the first edition of Religions of the World became a reality and was published in 1979. Dr. Hopfe was “an author, teacher, pastor, archaeologist, college dean, weight lifter, and spiritual guide to students, colleagues, and parishioners” whose lives he touched via the written and spoken word. Religions of the World is his legacy to academia. Mark R. Woodward is Associate Professor of Religious Studies at Arizona State University and Visiting Professor of Comparative Religions at the Center for Religious and Cross-cultural Studies at Gadjah Mada University in Indonesia. He received his Ph.D. in Cultural Anthropology from the University of Illinois and also studied at the Divinity School at the University of Chicago. His research has focused on Islam, Buddhism, Christianity, and indigenous religions in Southeast Asia, especially Indonesia, Burma, and Singapore. For most of the past decade his research has centered on issues of religion, conflict, and violence in Southeast Asia and globally. He is the author, co-author, or editor of five books and many scholarly articles. He has taught the introductory level university course World Religions more than fifty times in the last twenty-five years. Brett Hendrickson is an Assistant Professor of Religious Studies at Lafayette College in Easton, Pennsylvania, where he teaches courses on the religious history of the Americas, religion and healing, religion and public life, and the introductory course on world religions. He received his Ph.D. in Religious Studies from Arizona State University, a Master of Divinity (M.Div.) from Austin Presbyterian Theological Seminary, and an A.B. in Latin American Studies from Columbia University. Hendrickson’s research examines lived religious practices in Latin America and among Latinos and Latinas in the United States, with a special interest in religious and folk healing. His work attempts to explain religious interactions and exchanges among various ethnic and cultural groups in complex political and social contexts. He is the author of Border Medicine: A Transcultural History of Mexican American Curanderismo and several scholarly articles.